Spend the day following the historic Apache Trail on a guided true wilderness adventure. Enjoy a visit to Goldfield Ghost Town, Tortilla Flat, and a boat ride on Canyon Lake. It's a perfect day out in the Sonoran Desert. Goldfield, aptly named after the precious metal that was found in the area, was incorporated in 1892. For 5 long years this town was a gold miner’s Mecca, however, soon after the vein stopped producing, Goldfield quickly turned into a gold mining ghost town. During the tour you will have a chance to spend time in this restored ghost town with opportunities to practice your gold panning techniques, marvel at the original mining gear, or even spending some time at Lu Lu’s Bordello if you dare. During your tour along the Apache Trail, you will be treated to a steamboat ride on Canyon Lake by the famous Dolly Steamboat. As part of the 6-mile narrated nature cruise, keep your eye out for Big Horn Sheep, Bald Eagles and a host of other desert animals as well as unforgettable views of 1300-foot volcanic cliff walls of Canyon Lake. Following your steamboat ride, visit Tortilla Flat and just beyond that Fish Creek Hill in the Superstition Wilderness. 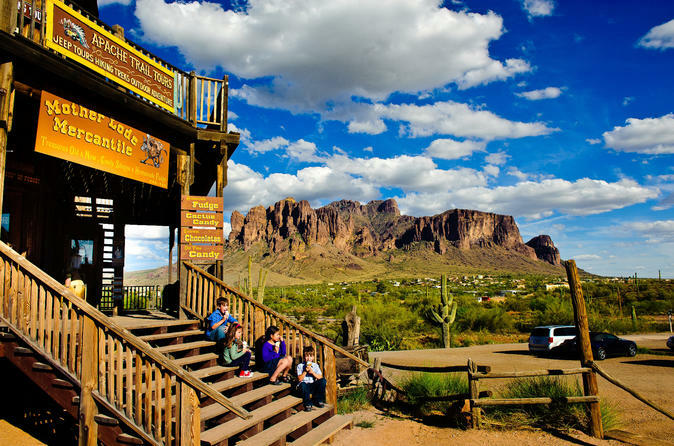 Tortilla Flat has become a fixture of the Apache Trail since its inception in 1904. Nothing could destroy this stage stop which holds onto its rich tradition through its architecture and unique decorating sense. At Fish Creek Hill overlook, enjoy views of the Sonoran Desert and Superstition Wilderness from your amazing vantage point. The Superstition Mountains are truly a breathtaking sight to behold. This rugged landscape in the Sonoran Desert has been the jewel that some men were looking for with the most famous involving the Lost Dutchman Mine. Rumored to have found the largest gold vein in the west, German immigrant Jacob Waltz trusted his newly found gold deposit to no one and the secret of its location was buried with him. If you have the “golden eye” maybe you can spot it while on tour!